This edition features reports of the Labour Party Conference in September, the latest meeting of the National Policy Forum and the meeting of Labour International. Read also Stephen Kinnock and Emma Reynolds views on Brexit. Conference report: Europe – not “in or out” but “left or right”? Brussels Labour, Labour International, and anyone with an interest in European politics came away revitalised and optimistic about Labour’s commitment to internationalism, and its prospects for the 2014 European elections. 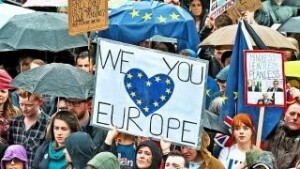 The European events themselves were lively, well attended, and set out the pro-European case very well. Brussels Labour’s fringe, co-hosted with the Labour Movement for Europe, was a case in point. Over 150 of the party faithful battled across Manchester through thirst-quenching rain on Sunday lunchtime to hear a well-informed debate “Europe – moving beyond austerity onto plan B.” It was a particular pleasure to see former Brussels Labour Treasurer, Emma Reynolds MP, now Shadow Minister for Europe, speaking against the backdrop of our very own Brussels Labour banner. Brussels Labour’s Honorary President Neill Kinnock chaired the event, and was as surprised as anyone that the first intervention from the floor was from Tim Montgomerie of the influential ConservativeHome website. I suppose he would be hard-pressed now to find 150 pro-Europeans in the whole Conservative party, never mind at one of their fringe events. It was great to see Axelle Lemaire as one of the speakers at the Labour International and EPLP breakfast fringe , where again it was standing room only. Axelle represents overseas voters in the French parliament, and many of us would like the UK to give us similar representation. One theme that came across from all European events want that the UK is just about the only country which sees the EU not in terms of whether it should move left or right (and move on from Camerkozy austerity) but only whether we should be in or out. Glenis Willmott MEP’s plenary speech argued cogently for the Labour to set out a progressive vision for Europe, in particular with initiatives such as the Youth Jobs Guarantee, and although Ed Miliband’s speech as leader was light on detail, he gave a clear commitment to engagement in Europe and internationalism. In June 2014, people from across Europe will elect the next European Parliament. They probably won’t do so in great numbers: at the last election in 2009, turnout was less than 50% in more than two-thirds of the European Union’s 27 member states. In the UK, just over 34% of people voted. But next time, it could well be different. The European elections – which inspire apathy among many, and probably no more than a dutiful trudge to the polls for those who do vote – could have a major bearing on the UK’s future role in the world. 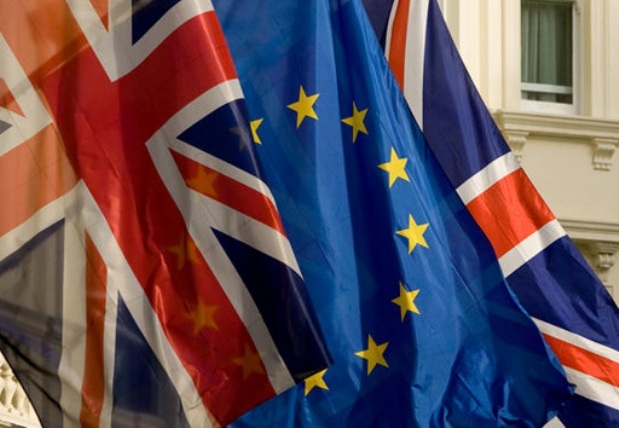 A win by the UK Independence Party at the 2014 European elections could set the UK on the course to a referendum on EU membership, and a likely exit from the EU (a rational debate being improbable in the hothouse atmosphere of a referendum campaign). This is something that is already concerning David Cameron. It may seem absurd to suggest a Ukip win. This is, after all, a party that has no representation in the Westminster parliament. It has a history of infighting, expulsions and defections in the European Parliament and is a marginal annoyance in the chamber, with little influence. Ukip’s best ever performance in a national poll was in 2009, when it won 13 of the UK’s 72 seats in the European Parliament and beat Labour into third place. But that result was achieved with only 16.5% of the vote – and that on a low turnout and in an elected directly related to the party’s core issue. However Ukip is regularly scoring around eight per cent in opinion polls – occasionally nudging ahead of the Liberal Democrats. It has dozens of councillors, especially in the Midlands and the South. And the Conservatives, now in power, will not attract in 2014 the protest vote that helped it to win the last three European elections. With the Conservatives now engrained with Euroscepticism, many Tory members could well lend their vote to Ukip to expedite the road to a referendum. David Cameron is well aware of this fact – hence this weekend’s shift from opposing a referendum on the UK’s membership of the EU (Saturday) to supporting one (Sunday). By Monday morning, his people were floating a potential date of May 2015, to coincide with the next general election. This is cold and cynical calculation by the Prime Minister. He is cowed by the 100-or-so Tory backbench MPs who are strongly Eurosceptic and either want an ‘in-out’ vote or, as in the case of the former defence secretary, Liam Fox, a fundamental renegotiation of the UK’s engagement in the EU. As The Guardian neatly put it this morning, Mr Cameron is “led by the noes”. Despite the Prime Minister spending two years telling the country that he is governing in the ‘national interest’, he now appears to be governing in the interests of the Conservative Party. He is playing fast and loose with the UK’s most important international economic and political relationship. It is a dangerous game. The apparently hubristic obstinacy of Berlin (“if only the Greeks could be more like the Germans”) cannot be fully understood if the constraints are ignored. As others have commented, the new Germany has a strong economy but a weak political system: federation means that regional elections are taking place on average three or four times a year somewhere creating a climate of perpetual electioneering; public opinion and an increasingly eurosceptic press is unsympathetic towards the profligate south, and mistrusts European institutions; a cautious and sometimes vacillating Chancellor presides over a fissiparous coalition, one partner in which while under threat of extinction openly flirts with euroscepticism; any new measure requires the explicit approval of the Bundestag and in practice gives a veto to the SPD opposition; and the increasingly assertive Constitutional Court may on any occasion block any measure which is interpreted as ceding power to supranational institutions. The markets may ‘demand’ immediate action from Europe and from its largest member state in particular, but the German political system is poorly placed to oblige. Paradoxically, the notion of ‘a great leap forward’ to political union begins to make sense in this context. Everybody can now see the institutional design faults in the original euro governance. It is also understood that guarantees for the debts of others require elements of multilateral supervision and even control of national budgets. The only way forward which would be compatible with German ideology and its constitutional requirements would be some transforming act of integration; with a quasifederal political union as an essential precondition for a fiscal and banking union. Hence in the last few days, Eurobonds and a banking union are no longer dismissed out of hand, but viewed as problems of sequencing, as things which might be possible were the road cleared for political union. Hence the Chancellor and in particular her Finance Minister have upped the rhetoric on federal union. Hence her Foreign Minister has convened a working group to prepare constitutional proposals, and, paradox of paradox, intends inviting Laurent Fabius, the new French foreign minister, widely seen as the man who scuppered the Constitutional Treaty, to join. In last Sunday’s Observer, we were told that Ed Miliband is being urged to pledge an ‘in-or-out’ referendum on the UK’s membership of the European Union should Labour be elected in the 2015 General Election. It is clear from this article, and other noises off (by Lord Mandelson, for example) that Labour Party opinion is being prepared for a change in direction, just months after Labour rejected the idea of such a referendum in a House of Commons vote. It is ‘clever politics’, we are told. (For fans of political irregular verbs, I practise clever politics; you are opportunistic.) My view is that Labour is playing with fire. We do not want the most likely outcome (withdrawal), and while there may be some initial advantage in being the first to commit to such a referendum, the Conservatives, under pressure from the UK Independence Party, could do nothing but follow suit – eliminating that advantage. If Labour did win in 2015, what next? There would be a distracting and unnecessary referendum. The Labour Party would be divided. The referendum would, based on current opinions, be lost. The government would lose credibility and authority just months after it had won an election. Instead, Labour should be working with its Socialist colleagues to develop an effective vision for Europe – a way-out of the dead-end into which the austerity-fetishists have driven us. There are also non-partisan arguments against a referendum on EU membership. We are told that a plebiscite will ‘settle this issue once and for all’. This is nonsense. A narrow victory for the ‘pro-EU’ campaign – the only type of victory supporters of EU membership could possibly imagine at this stage – is more likely to give succour to the UKIP and its allies. The question will continue to be part of public discourse and we could well see a further referendum after the 2020 election. If anyone thinks Nigel Farage or Daniel Hannan will say, ‘Well, we gave it a good shot but the people have spoken and that’s it for another generation’ then they are seriously deluded. And that is not to mention the many good reasons to oppose referendums on principle. They can be dangerous, distilling complex political debates into bumper-sticker-friendly yes-or-no arguments. Their results are misleading and without nuance. Options A and B may be on the ballot paper, but options C and D may be preferable to both. The 1999 referendum in Australia on maintaining the Queen as the Head of State is a case in point: polls showed that the majority of Australians wanted a republic – but they did not want the type of republic offered in the referendum. In the case of a vote on EU membership, people are being asked to take it or leave it – not to express discontent with particular parts of the European project and support for others, a position that probably reflects the majority view. On 13 October 2011, Jan Royall, Baroness Royall of Blaisdon, delivered the John Fitzmaurice memorial lecture. A summary of the lecture is below, and the full speech can be read here. 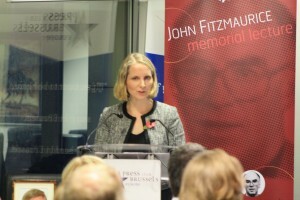 Jan Royall was very happy to be back in Brussels to deliver the 2011 John Fitzmaurice memorial lecture. For her, Brussels bring together three of the most important things in her life democratic socialism, Europe and friendship – and there were many old friends in the audience whom Jan had met during her time in Brussels. Currently the Leader of the Opposition in the House of Lords and a Privy Councillor, Jan had previously been Leader of the House of Lords and a member of Gordon Brown’s cabinet from 2008-2010. During her time with the European Commission, she was a long-serving member of the cabinet of Neil Kinnock and then Head of the Commission’s office in Wales before she re-entered British politics full time. Jan’s lecture began by looking back 16 years to the start of her time in Brussels – when Europe was a “beacon of hope” and there was optimism about jobs, growth and a prosperous future. She regretted that more progress had not been made during the good times and that a lack of sufficiently bold political leadership contributed to the current problems. Refreshingly she did not hesitate to be critical of some aspects of the European project – in particular the absence of the right mechanisms to manage the euro, and the fact that the EU institutions are too ‘distant’ from citizens. One recurrent theme in her talk was the nature of the British press. A situation where politicians fear press reaction to their comments stifles them from saying what they really think – and so stifles meaningful broad debate on issues such as ‘Europe’. Jan concluded her talk by recalling John Fitzmaurice fondly. “He was a decent and delightful human being”, she said. Jan reminded the audience that he was active not only in the European institutions and at high-level summits, but also on the ground: standing in elections where he had almost no chance of success, and taking progressive democratic socialism ideas and arguments to the doorsteps across the UK. There is more information on prostate cancer tests here.